02/10/19: Added listing for Marantz 2385 on Paul's Receiver Rack. 01/11/19: Revised Sansui TU-X701 writeup. 01/05/19: Revised Realistic TM-1000 writeup. 01/01/19: Happy New Year everyone! Revised Sony ST-SA5ES writeup. Also, MOST, but not all, of the "check eBay" links around the site have been repaired, so you can once again jump from a review on TIC directly to the eBay listings for that tuner. The remaining bad links will be fixed as time permits. 12/29/18: Revised JohnC's mod recipe for the Sansui TU-X701 on the DIY Mods page. TIC's panel of experts (including audiophiles, FM DXers, engineers and tuner collectors) and an elite team of trusted contributors have personally used and reviewed hundreds of different FM tuners. We're also requesting input from readers on about 175 tuners listed in the On-Deck Circle, some of which will be added to the review pages once first-hand information is obtained and as our Editor's time permits. We focus on tuners, rather than receivers, because (a) very few receivers come close to matching the performance of that manufacturer's top tuners, and (b) we stick to what we know best. Our primary emphasis is on tuners that were manufactured between the early 1970s and the early '90s, before home theater receivers largely replaced separate stereo components. We will review tuners of more recent vintage, but do not seek them out as fervently as we do the older stuff. Your own experience with a particular tuner will depend, to some extent, on reception conditions in your local area. For example, a listener in a metropolitan area where strong local stations crowd the FM band will need a tuner with excellent selectivity if he or she wishes to receive any of the more distant stations between the locals. (Alternate channel selectivity is the measurement of a tuner's ability to reject an interfering signal 400 kHz, or .4 MHz, away from the station you're trying to hear. Adjacent channel selectivity, rarely quoted in manufacturers' specs, refers to rejection of a station only 200 kHz, or 0.2 MHz, away from the one you're tuned to.) Overload rejection and image rejection are other important considerations for listeners who live close to stations' transmitters. Listeners in more remote or rural areas, however, will generally be more concerned with sensitivity, which is the tuner's ability to clearly receive weak stations' signals. Many tuners with good sensitivity can be modified to be more selective, but poor sensitivity cannot easily be improved upon. See the Better FM page for info on diagnosing and correcting FM reception problems. Manufacturers' own specifications for sensitivity and selectivity are sometimes imprecise or exaggerated, and even two examples of the same model tuner may be very different in performance (especially when they're 20 or 30 years old!). Also, a tuner that is out of alignment will not function properly; Stereophile's reviewers even used to receive brand-new misaligned review samples occasionally. For what they're worth, key specs for many top tuners may be compared on the Specs Database page. One important reception characteristic of a tuner that is often overlooked, and rarely listed accurately on a spec sheet, is the tuner's ability to handle strong signals that can create mixing products. The typical problem occurs when two or more strong local stations on different frequencies, as a result of non-linear effects in the tuner, combine to create a distorted signal at another frequency that is stronger than the station that should be there. This usually happens when the RF gain transistor and/or mixer is driven to overload and creates harmonics of a local station. These harmonics then mix with other strong stations to create ghost stations in the amp or mixer. In very dense urban markets, the harmonics created can be so numerous as to create an overall increase in noise on all stations. In FM tuners, the most common RFIM distortion results from two stations mixing together in the relationship 2*f1-f2 or 2*f2-f1. The most troublesome mixing products are caused by very strong stations that are close to each other in frequency, and also close to a desired weaker station. This is because RF gangs are generally 2-3 MHz wide, and most tuners have only one gang in front of the first RF amp (although better tuners have two gangs before the RF amp). When the gangs cannot attenuate undesirable strong signals, the ability of the RF amp and mixer to withstand RFIM is tested. For example, subtracting 93.3 from the second harmonic of 94.1 would yield a mixing product at 94.9, and there are other possibilities like f1 + f2 - f3. These stations are all so close in frequency that one gang of the front end will do little to attenuate them. In cases like this, using a directional external antenna is the best way to prevent the unwanted stations from overloading the front end. Many tuners also have provision for handling strong RF signals, which usually means circuits to bypass RF amps, add attenuation, or both. The problem with this is that the weak station you want to listen to also gets less gain/attenuated. It should be noted, though, that this scenario in which all three stations are less than 2 MHz apart is the worst case. Usually the strong signals are farther apart in frequency, or farther away from the one you are trying to listen to, and then the gangs will do their job and attenuate strong offending stations. All other things being equal, two bandpass filters will have better out-of-band rejection than one, and for this reason two gangs before the RF amp is preferred over one in very strong signal environments. Mixing products can be referred to in many ways - intermod, IMD (intermodulation distortion), RFIM (RF intermodulation), third-order IM, etc. A calculation of how an individual amp, mixer, or composite RF stage can handle third-order RFIM, called "IP3" (third-order intermodulation product), is a combination of measurement and graphical extrapolation, usually expressed in dBm (the higher the better). In tuner specs, in theory, the ANSI/IEEE 185-1975 tuner spec for Spurious Response Ratio (6.15.1) should capture the worst case of three individual measurements, one of which is a very difficult third-order RFIM measurement (section 6.16, RF Intermodulation, where two RF generators, one at 98.8 and the other at 99.6 MHz, are used while monitoring 98 MHz for interference). For some reason, based on a survey of tuner owners and written opinions of others like David Rich, it does not. Perhaps the wording of the spec itself, confusing at best, is to blame. Or perhaps creative marketing departments chose to interpret the spec to mean the best, not worst, of the three measurements. A few tuner companies do break out and independently specify third-order RFIM; Accuphase, for example, lists 80 dB for the T-109V. For most tuners, however, field testing under actual conditions appears to be the best way to determine resistance to strong-signal overload, unless you have access to RF instruments and can perform the RFIM measurements yourself. In general, many, but not all, older tuners designed before the modern FM station congestion can have problems with RFIM. This would seem to include models like the Marantz 10B, according to personal accounts by some of our contributors, who said the Scott 310 series had much better RFIM performance. Our panelist David "Anonymous" adds, "The problem of RFIM is caused fundamentally by too much gain and not enough selectivity in the front end. It is worsened by adding an RF amp in front of any tuner even if there are tuned elements in front of it. Also, the use of RF AGC worsens the problem and can create additional harmonics. Therefore, having two or even three tuning elements (caps or varactors) prior to any RF amplifier elements helps a great deal because it limits the bandwidth coming in and therefore the total energy being directed at the RF amp(s) and the mixer. This is correctly called RFIM and is usually specified as a level of attenuation relative to a certain deviation from the tuned center frequency. It is important to understand that a 7 effective gang tuner that is arranged as 3 tuning elements, an RF amp, 3 elements, a mixer and a single element for the local oscillator will radically outperform a 7-gang tuner that has 1 element, an RF amp, 2 elements, another RF amp, 2 elements, a mixer and 2 tuned elements for the LO. Also, a tuner with a single properly designed RF amp will always outperform another tuner with two RF amps in terms of the RFIM parameter. In addition, unless varactors are very carefully selected and designed, there is fundamentally more front-end selectivity when one uses tuning capacitors." Our contributor Brian Beezley, however, disagrees with David on one point: "RF AGC does not necessarily worsen RF intermod. If the intermod originates in the mixer, AGC will help, not hurt. This is the usual case. For example, when I added RF AGC to my Kenwood KT-7500, stations that were obliterated by RF intermod popped out of the grunge and became listenable." Ken Wetzel, an RF engineer, posted in our FMtuners group about the effects of antenna amplifiers on RF intermod: "The part of the tuner most vulnerable to 'overload', or the creation of IM spurious signals, is the mixer. The more gain that precedes the mixer, the more IM the mixer will create. The IM created in the input RF amplifier of the tuner is generally insignificant compared to what's created in the mixer. Overload in the IF amplifier of an FM tuner will not be noticeable except with laboratory instrumentation. "RF engineers use the 'third order intercept point' (IP3) as a figure of merit of an RF component's susceptibility to creation of IM. The higher the IP3 number, the better. I've measured the IP3 of a few tuners and found a wide variation. A Technics ST-9030 had an IP3 of +6 dBm, while a Kenwood KT-7500 had an IP3 of -21 dBm, with other good tuners falling between those two. Those values are for undesired signals 400 kHz apart (alternate channel spacing). For signals with a spacing of 1 MHz or more, the IP3 performance improves dramatically. "As far as antenna amplifiers go, I haven't measured consumer-grade units, just a couple of communications-grade units. The IP3 of an FM head-end preamp was +20 dBm, and the IP3 of a GaAs pHEMT preamp was +11 dBm. I would guess that a consumer-grade antenna preamp would be in the range of 0 dBm. "The bottom line: Any gain added before an FM tuner will degrade its IM performance. For signals closely spaced, IM performance will be limited by the tuner, degraded by the added gain of the antenna amplifier. For signals widely spaced, IM performance will be limited by the (consumer-grade) antenna amplifier. So we understand what we're talking about, the effect of inadequate IM performance of an FM tuner will be the creation of signals at the wrong frequencies across the dial. Those false signals are usually very distorted. If the frequency where a false signal is created happens to be your favorite low-power college jazz station, the effect will be elevated background noise, especially in stereo." Gangs: In our reviews, we usually mention the number of FM (front-end) tuning elements in a tuner, when known. These elements can be either variable capacitors or diodes that vary capacitance as a function of voltage, known as varactor diodes. As a general rule, older tuners typically have variable capacitors and newer ones tend to use varactor diodes, but there are exceptions to both. The term "gangs" refers to individual capacitors physically tied together such that they all change capacitance when the tuning mechanism is actuated. We may refer to both varactors and variable capacitor sections as gangs for convenience, or call varactors "the electronic equivalent" of gangs. 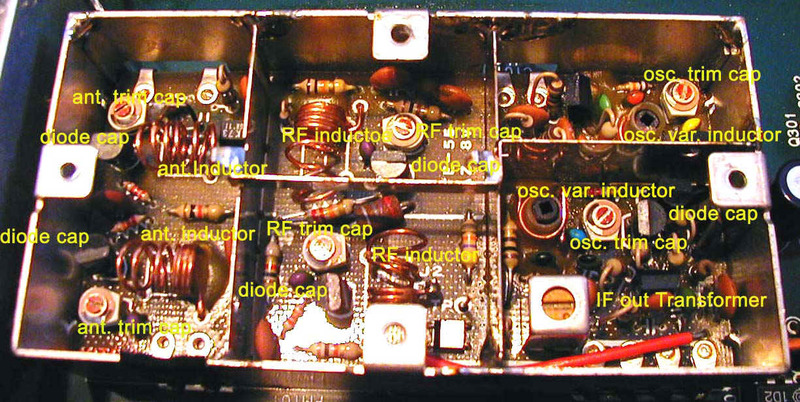 Variable capacitors are superior in a number of respects: they are essentially perfectly reliable as passive components, as opposed to active diodes which can be damaged electrically; and they maintain their characteristics across the FM band, as a function of signal level, and have a much higher Q (essentially the ability to reject unwanted frequencies in favor of a desired frequency). Variable capacitors create some measure of front-end selectivity where it has no negative effects on the signal, as opposed to selectivity in the IF which can have a profound impact on the signal. The number of gangs and the overall front-end architecture of a tuner directly correlates with its ability to reject spurious signals and images, and usually indicates the tuner's ability to handle strong signals from local transmitters without overloading the front end. Our contributor Brian L. explains why: "Each tuned stage is tuned to a particular frequency and amplifies that frequency only (actually, a range of frequencies near the desired frequency). The RF amps are tuned by the gangs of the tuning capacitor, one gang per tuned circuit. One gang is left over to tune the local oscillator (LO). Therefore, a 3-gang tuner has only two tuned circuits to select the desired station and reject the rest. A 5-gang tuner has four tuned circuits to select only the desired station's signal and this leads to better attenuation of the undesired signals, i.e., better image rejection and better overload protection from other stations removed from the desired station." Many other factors, including, but not limited to, mixer design and RF amplifier topology, also influence RF performance. How the gangs are arranged and what they are used for is also critical. For example, a 7-gang tuning capacitor can be arranged as one section prior to the first RF amp, two sections prior to the second RF amp, two sections prior to the mixer and two sections tuning the local oscillator and a buffer (1/2/2/2), or it can be arranged as (2/2/2/1). Different front-end architectures can be expected to yield different performance from the same number of gangs. However, we have found that the number of gangs can be a convenient "shorthand" indication of the overall build quality of a tuner, affecting sensitivity, image and spurious signal rejection, maximum signal-to-noise ratio, and other front-end parameters. This attention to detail and performance in the RF front end may, or may not, carry through to the IF, detector, multiplex and audio stages. The number of gangs used commercially in quality tuners has ranged from a low of 3 to a high of 9. Each tuning element inserts loss that must be compensated for by RF amplification or the gain of the antenna. Some tuners have different operating modes or bypasses that reconfigure or bypass gangs. We have found that tuners need a minimum of 5 gangs to perform optimally over a wide variety of reception conditions, but some 4-gang tuners will provide excellent performance in most situations. Even some 3-gang tuners are quite sensitive, but may have problems with strong signals showing up in many places across the dial due to front-end overload. Our contributor Eric B. posted a nice (mostly correct) writeup on counting gangs in our FMtuners group. Here are some photos showing two of the possible configurations of 4 FM gangs and 2 AM gangs in the tuning capacitors of the (analog) Sansui TU-717 and TU-719, and the varactor (digital) equivalent of 6 FM gangs in the Sumo Charlie. Filters: All tuners use IF (intermediate frequency) bandpass filters nominally at 10.7 MHz. From the 1970s on, multiple 2-stage ceramic filters have been used to attempt to eliminate alternate channel interference and minimize adjacent channel interference. "Filter mods" are modifications that involve (among other things) replacing the tuner's original ceramic filters with narrower bandwidth filters to improve selectivity, and some information on this site is intended to assist and encourage those who wish to do so. In our reviews, we usually include the number of ceramic filters for which the tuner has slots in its circuit board, when known. A tuner with 3 or more filters can almost always be made more selective with a filter mod, and the most selective tuners use 4, 5 or even more filters. See Bob's Filter Corner for more information on filters and filter mods, with links to other good info, and see below for info on Bill Ammons' Filter Adder PCB. Would-be filter modders are cautioned that while replacing a tuner's stock filters with new narrower ones will certainly improve selectivity, if the new filters have not been professionally measured and matched, there is likely to be a noticeable degradation of audio quality. Particularly when changing filters in a digitally tuned receiver, one should ensure that the new narrow filters are centered right on 10.7 MHz, because the filters purchased could easily be centered anywhere from 10.67 to 10.73 MHz. An alignment can improve a tuner's weak-signal reception, distortion, and stereo separation. Also, in many cases the tuning dial reads incorrectly, and an alignment solves that problem (although it should be pointed out that a well-calibrated tuning dial does not necessarily indicate that the tuner is properly aligned). Setting the tuner's detector correctly can also improve reception of adjacent-channel stations. If one listens primarily to strong local stations, it may not be apparent that a tuner is out of alignment, and a misaligned tuner can have sensitivity as high (poor) as 10-15 uV and still sound fine on locals. With a good alignment, the sensitivity of many top tuners can be improved to 1.5 uV or even lower. To do a decent tuner alignment, one needs a low-distortion FM generator made exclusively for FM tuner work, like a Sound Technology ST-1000A; a good AC/DC multimeter; a 100 MHz oscilloscope with X-Y capability; a 125 MHz counter; a very good distortion meter; and a very low-distortion audio signal source. Then a bunch of BNC cables, test leads, probes, etc. In some cases, you may have to build adapters or probes from scratch or otherwise improvise. Procuring the equipment is one thing, and figuring out how to use it successfully is another. Many people could do it with proper training and help, but it is best learned by observing in person, like learning a trade, rather than by reading how to do it. Usually the manual for the stereo generator is a good starting point. Our panelist Bob discusses alignment techniques in our FMtuners group in the series of posts beginning here, and here is a useful discussion of alignments of Scott tuners, most of which have broader application. A current source of high-quality FM Stereo alignment generators is Levear (formerly called Panasonic). These are sold and supported by Howard Anderson at WHA Electronics, reachable at whaelecATinsightbb.com (replace the AT with an @ sign). When selecting a shop for tuner modifications, repairs, or even just a tuneup, ask what kind of test gear they use to complete the final RF checkout and alignment. We believe it is critical that RF mods, repairs, and alignments be fully measured to ensure that the tuner meets or exceeds factory specs as set forth in the service manual. This critical measurement should be in addition to the final listening test. "The point of this is twofold. One, to give people a map or learning process. Second, to help by identifying the material that should be covered, and key phrases to be used in searches. You should be able to get all the info you need on the internet. To understand an FM tuner, you need to understand FM. Keyword searches in places like Wikipedia, or in general on the internet: FM carrier, FM modulation, FM de-emphasis, FM stereo MPX decoding. Questions you need to understand: What is the FM deviation standard? Why are pre-emphasis and de-emphasis used? How is an audio signal's amplitude represented in an FM signal? What is the standard for stereo pilot frequency and level? How does stereo multiplexing work? Next, study examples of FM tuner service manuals. Start by reading the theory of operation, then the tuner block diagram, and identify the above sections on the block diagram. Make sure to include all three technologies if you want to get the full spectrum. Then work at identifying the above sections on the schematic. Many service manuals are here on TIC, in our Yahoo FMtuners group, and in the other four Archive and For Sale groups linked on the FMTuners home page (most of the tube tuner manual and schematics are in the For Sale group). A really good read on the state of modern tuners, including explanations of many sections above, can be had by reading David Rich's two FM tuner articles in Issues 23 and 24 of the Audio Critic, located here. Completing this self-study exercise should give one the background needed to start aligning and repairing FM tuners." See our DIY Mods page for information on modifying tuner audio sections. Bill Ammons, DeWick Repairs and Audio Video Service Labs, all listed just below, are well-qualified to do this work. Bill Ammons, an RF design engineer with more than 20 years of experience in the broadcast equipment industry, manufactures a small PCB called the IF FILTER ADDER PCB (TM). This small PCB fits in place of a standard ceramic filter and provides sockets for two filters plus some additional IF amplification. There's more information about the board on our Filters page, and here are some of the variations: switchable PCB 1, switchable PCB 2, PCB for KT-8300, PCB for TU-919. Bill also measures and sells matched sets of ceramic filters, and sometimes has modified tuners for sale to DXers or audiophiles. Bill is also experienced in AM stereo tuners and has filters available for AM IFs as well. Contact Bill at ammonsphxATearthlink.net (replace the AT with an @ sign). Unfortunately, the major antenna manufacturers (Winegard, Channel Master, etc.) no longer offer FM antennas, but the little four-element antenna from Stellar Labs isn't bad. To demystify the murky world of antenna specifications, be sure to check out our contributor Brian Beezley's website, with computer-modeled performance results and reception patterns for many antennas. The Carver TX-11b's owner's manual also has a very nice section on antennas. TIC's top recommendation for tuner repairs (but not mods) is Mark Wilson in Savage, Minnesota, a/k/a Absolute Sound Labs and Audiosonic Service. Mark has been doing audio restorations since 1964 and his work gets rave reviews from our contributors. Mark can handle repairs and restorations of almost any vintage equipment, including tubed gear and peculiar brands like Sumo, and offers a six-month limited warranty on all restoration work. As an authorized McIntosh Service Center, Mark has access to original McIntosh parts, can service their equipment dating back to the 1950s, and also provides warranty service for newer Mac products. Email mcintoshATabsoundlabs.com (replace the AT with an @ sign) for McIntosh inquiries, or audiosonicATabsoundlabs.com (replace the AT with an @ sign) for non-McIntosh inquiries. You can also visit his website or call him at (952) 894-5580. Terry DeWick in Knoxville, Tennessee, is well known to many McIntosh customers as an extremely talented technician, but his expertise and services are not limited to McIntosh products. He states on his website: "Specializing in the repair of audio equipment both Solid State and Tube, old and new. Also repair of Antique Radios, A.C. and battery. Authorized McIntosh warranty repair. Tuner alignment and updates, Amplifier updates, measured data returned with each unit." Terry's work has received great reviews from members of our FMtuners group. Email Terry at dewicktATesper.com (replace the AT with an @ sign) or call him at (865) 691-2446. Mike Williams of Radio X Tuners and Audio in Flint, Michigan specializes in repair, restoration and modification of FM tuners. Once a part-time hobby business (we asked Mike several years ago if we could list him here but at that time, he was swamped with work even without us), Radio X is now operating full time and will take on just about any audio project you may need. Radio X is also the sole U.S. repair facility for Blue Circle Audio Products. Mike has been used and recommended by many members of our FMtuners group, who praise both the quality of the work and Mike's communication. How's this for a testimonial? Check out Radio X's website at www.radioxtuners.com, email Mike at hifitechATcomcast.net (replace AT with an @ sign), or call him at (810) 919-6562. Tim Schwartz of Bristol Electronics in Ho-Ho-Kus, New Jersey has worked on several pieces for two trusted TIC contributors, one of whom says, "His work is superb, turnaround time reasonable, fairly priced, and he's honest to a fault." Tim is a Certified Repair Facility for McIntosh, Arcam, and several other brands, and is also a helpful member of our FMtuners group. He can be reached at (201) 447-4299. Rick Rupert in South Williamsport, Pennsylvania offers repairs and restorations on all makes of tuners, receivers, and other equipment, whether new or vintage, tube or transistor. Two trusted TIC contributors vouch for his work. Contact Rick at rrupert104ATaol.com (replace the AT with an @ sign) or call him at (570) 323-2911. Foster Blair rebuilds and repairs all types of vintage Scott equipment, including amplifiers, tuners, multiplex units, and the hardest to work on, tube receivers. He has over 35 years experience working with Scott equipment and has an extensive collection of vintage Scott gear. Foster has the necessary test equipment, schematics and knowledge to fix dead, sick or wounded Scotts at very reasonable cost. Contact Foster at fjblairATcomcast.net (replace the AT with an @ sign). Approved Audio Service in Bantam, Connecticut claims to "specialize in repair and calibration of all high-end audio equipment." None of our panelists has used them, but based on our discussion with them they seem to have good expertise, good equipment, and fair prices for alignments and repairs. They're an authorized repair center for many high-end brands and one of the few options for Tandberg owners. Visit their website for more information. Mike Zuccaro in San Diego, California is willing to tackle repairs on any tuner or receiver, whether tube or solid state, stereo or mono, including high-end units like Sequerras and Marantz 10Bs and even "exotic stuff." (But don't ask him to do mods -- he believes it's impossible to improve on the designer's original parts choices.) None of our panelists have used him but his work has been recommended by others. Mike is a McIntosh factory authorized service center. Contact Mike at mjzuccaroATaol.com (replace the AT with an @ sign), call him at (858) 271-8294, or visit his website. Please note that Ken Bernacky, a/k/a Stereo Surgeons, in East Hartford, Connecticut is emphatically NOT RECOMMENDED. We have heard some horror stories in our FMtuners group about tuners that Ken has held onto for YEARS (here's just one of 'em, part of a long message thread), and obviously he has forgotten that reputable businesses have an obligation to communicate with their customers. We're going to opine, without malice, that there must be some serious mental issue here, based on the number and severity of the complaints and Ken's utter failure to respond publicly to them. With so many other good techs recommended above, you'd have to have a screw loose yourself to send your equipment into the black hole of Ken's shop. In addition to a discussion of tuners and related topics, our FMtuners discussion group (groups.yahoo.com/group/FMtuners) contains photos of vintage equipment, old magazine ads and manufacturers' brochures, and a database page listing key specs of most of the tuners on this site (and some others). Registration is relatively painless. The most extensive online collection of radio, TV, broadcasting, electronics and engineering magazines (and more) resides at americanradiohistory.com. Our hats are off to David Gleason for putting together such an incredible resource. You could easily spend hours investigating the audio websites indexed at Steve Ekblad's Audiogrid. Audiolinks is another great compilation that also offers useful electronics FAQs. The Audiophile's Guide to the Galaxy is a concise collection of the best audio links, including discussion forums, tech stuff and DIY, etc. The Vintage Knob, a growing "online audio museum," has beautifully designed pages with photos and commentary on all types of audio gear (including tuners). TIC unabashedly borrows tuner photos from k-nisi's site (page 1, page 2, page 3), which has lots of cool Japanese tuners rarely (if ever) seen in the U.S. and other equipment, too (scroll down to the blue links). Thanks to our contributor Lorne in Japan for this translation of k-nisi's tuner pages. Ben Blish's classic-audio.com, the authority on vintage Marantz gear, also covers Pioneer and Technics equipment and has interesting material for all fans of vintage audio. Another stop for Marantz fans is the MarantzTalk group on Yahoo. Ben's site should not be confused with classicaudio.com, which features seriously outdated pricing data. There are a number of other good websites for fans of particular hi-fi brands. Sansui is well-covered with Dave Compton's Sansui appreciation site at classicsansui.net and the "Best of Sansui" site. There are also excellent Yahoo groups for Kenwood, Sansui, McIntosh and Realistic. Anthony Young has a site for Soundcraftsmen and his old Phase Linear site is now hosted by Rick Stout's StereoManuals.com. Rick has also resuscitated the old Vintage Technics site, with specs and brochure photos of all types of Technics equipment. Jim's SAE Site has information on SAE equipment, including specs and images of brochures, and there's an SAE Talk group on Yahoo that also covers Sumo equipment. Hans Hilberink's website covers vintage Luxman equipment, as does the Luxman group on Yahoo. The Radio Road board on Audio Asylum is that audiophile site's primary tuner discussion forum. There's also a tuner discussion board on Audiokarma, as well as manufacturer-specific forums (albeit with little tuner content) for Fisher, Kenwood, Marantz, McIntosh, Pioneer, Sansui and Yamaha. The Better FM page on Malcolm Pritchard's amateur radio site is the best explanation we've seen of ways to improve FM reception. It's an absolute "must read" for FM radio and tuner enthusiasts. Information on FM and TV reception and DXing is available from WTFDA, and Todd Emslie's website has some good info on sensitivity and selectivity from a DXer's viewpoint (please note that we don't endorse the use of 80 kHz ceramic filters unless you don't care how anything sounds). Our contributor Bruce Carter has a ton of great links on his page, and WTFDA member Mike Bugaj's website is a good DX-centric site. Prices for tuner service manuals on Rick Stout's StereoManuals.com are based on the number of pages which means that a short manual can be a bargain compared to his competitors' prices, and the quality of Rick's stuff and his customer service are second to none. Other good sources of manuals are Audio Video Service Labs; A.G. Tannenbaum, which also buys and sells old radios, TVs and test equipment; VintageAudioManuals.com; ManualMan; ServiceManuals.net; and Bob Adams (replace the AT in his email address with an @ sign), who offers photocopies of Sansui manuals. Yamaha maintains a Manual Library at its website with owner's manuals for 45 different tuners free for downloading. You won't find tuners at Radio Era Archives or antiqueradios.com, but they're also excellent sites. The most popular and efficient forum for buying and selling tuners is the marketplace for vintage audio equipment on eBay, which surpasses even specialized sites like Audiogon for purposes of liquidity (the ability to find a ready market whether you're buying or selling). Our panel has bought and sold on eBay hundreds of times, making us uniquely qualified to analyze prevailing prices of top tuners. Some will find the most valuable aspect of this site to be the updated, accurate sale price information for the equipment we cover. To make it easier for TIC readers to locate tuners on eBay, there are little "Search eBay" links next to most TIC tuner listings. But please note that eBay listings with misspellings or misplaced hyphens may not show up in the search, so if you're desperate to find a particular tuner you might want to do a search for all tuners by that manufacturer. Please note that some eBay sellers are not willing to stand behind what they sell, reciting the mantra "sold as is, as always with used electronic equipment." They're full of it! It's not "always" and it doesn't have to be that way. Prices listed on this site are for tuners sold by reputable sellers who guarantee that they'll work. "As is" sale prices are often much lower. If you're tempted by an "as is" listing, ask the seller specifically what problems the tuner has, and if you're not comfortable with the response, don't bid. If all the readers of this site try to avoid "as is" auctions (they're justifiable in some cases), we may even help reduce the number of shady sellers selling damaged items "as is" on eBay. Here is an eBay "Rogues' Gallery" to warn electronics buyers about nasty, fraudulent or maybe just deceptive sellers. If you've been abused or scammed, please email us with the details. And now, one of the sleaziest, most dishonest things we've ever seen. An eBay seller from Elmont, New York called "rego_rego" had a listing with the following line: "This is a beautiful Accuphase T-110CS DIGITAL TUNER. I'm not familiar with digital tuners so please do your research before buying. It has a nice DAC too if you don't use it as a tuner." The T-110CS was a CS-PCM tuner for satellite broadcasting -- a method of transmission that was available only in Japan and only for a couple of years in the mid-1990s. And the DAC has no typical digital input, only digital outputs, making this tuner nothing more than a very pricey doorstop for which our hero hoped to get $800. Our contributor doug s. reports, "I had some emails with this guy. He's a real a$$; is not at all interested in being upfront with the eBay buying community. He admitted to me that I might be right, 'maybe it's not a tuner.' He's definitely wanting to scam someone. He even bragged that he has already sold one for $1,000." Hey rego: Welcome to TIC, scumbag. Here's another lowlife, a guy with 100% feedback on eBay who doesn't mind flagrantly lying: eBay user "phastpay" wrote, "The website 'FM Tuner Info' states, 'The L0-7T tuner is the most sensitive and selective tuner yet reviewed'. This great ability of the Kenwood L-07T tuner to pick up stations is due to its 7 gang tuning capacitor (The most gangs ever used in a tuner!)." Of course, we never said anything of the kind, and there were a number of 8, 9 and even 10-gang tuners. He also said, "The L0-7T tuners are EXTREMELY rare and not found in the US. I waited four years and could not find one on E-Bay" - also nonsense. L-07Ts do pop up a few times a year on eBay. He also sold an L-07TII and said, "This tuner has the best selectivity and Sensitivity of any tuner as tested by the web site 'fmtunerinfo.com'" -- another outright lie. We suggest you avoid any future auction by this bottom-dweller. Sleazy ebay seller "bigappleaudio_2" intentionally posted fuzzy photos of his Sansui TU-X1 and wrote "All the pictures are part of my description" to deceive potential bidders into assuming that this tuner covered the U.S. and European FM band, when a very close look at the photos revealed that it actually tuned the Japanese 76-90 MHz FM band. When numerous members of our FMtuners group emailed him and we put up a warning here on TIC, he changed his auction listing to claim that we were trying to hold down the sale price for ourselves! Not quite, moron. 1. Don't sell to an eBay buyer with private feedback. If the buyer waits to initiate an "item not as described" PayPal refund claim until after the seller has received payment and left positive feedback, any negative follow-up comments posted after the original feedback will not be visible. 2. On eBay, buyers cannot receive negative feedback at all, so scams like this one are difficult to stop. 3. If you want to sell to overseas residents, be careful. Take good photos of your item and have available the original purchase receipt or some other evidence that the item is authentic. eBay seller "fareed110" has 100% feedback, but that obviously doesn't mean much because this guy/gal is quickly developing a reputation for ridiculous, exaggerated and just plain lying auction listings. His listing for a low-end JVC T-X6 tuner called it "legendary & magnificent," "superb, highly collectible," and "absolute top-of-the-line, audiophile." Wrong on all counts! This low-end digital tuner wasn't actually top of ANYTHING, and $269.99 plus $120.00 for shipping is about $375 too high. "This tuner is one of the very best JVC tuners ever made and one of the very best made by any brand in the golden vintage audio era!!" Oh, really? Welcome to the Rogues' Gallery, Sluggo. EDIT: Fareed110 is trying the same game plan with an Akai AT-V04, which at least is a decent tuner, but definitely not at a starting point of $224.99. He's asking least $150 too much on this one, but - guess what? It is also "one of the very best tuners made by any brand in the golden vintage audio era at this price range!!" And it looks like after fareed110 couldn't sell his T-X6, he decided to list it again under the name "rexdino55." With a starting bid of $78 he's only about $60 too optimistic this time, but he uses the same ridiculous language as in his prior listing. This idiot even points out that the tuner is "from the JVC/Victor section of my collection." Sheesh. Several TIC readers had unpleasant experiences dealing with a guy named Henry Jean-Louis of Valley Stream, New York, who used to pad his feedback by buying books for a penny and then tried to sell things like multi-thousand dollar Accuphase equipment. He used to go by the names "mcsolaar2002," "accuphasedealer," "nmt_student," "lynda_boutique" and "pure_audio_master" on eBay and used the names "Takanatokumoto" on Audiogon. On eBay, he made his feedback and bidders' identities private, which prevents good Samaritans from emailing the bidders to warn them. You can read about Henry in our FMtuners group in a series of posts that begins here, or in the Yahoo Classic Sansui group in a thread that begins here. Our thanks to Beatlefred and everyone else who helps us keep track of Henry's activities. An eBay seller from Ontario called "vintage_audio_2000" appears to be just a new name for the guy who used to call himself "vlad20001." Vlad was not in Henry's league, but do a Google search for "vlad20001" and you'll see why he should be avoided. Our contributor Chris bought a tuner from him and reports: "Vlad waited for a week after receiving my payment before shipping. There was a 'hidden' handling fee, and he ignored two e-mails regarding info on shipping dates. The unit was adequately, but not well packed. In other words, he makes the minimal effort on his schedule." And then the tuner arrived with a mechanical problem, but it's not certain that Vlad was aware of it. Another eBay seller named "trabuegentryauctions" sold cheap Allen wrenches for $9.99 apiece by calling them "Sansui Tuner [or Amplifier] Tuning Tools." He ran out of suckers and stopped doing this, but we'd continue to avoid his other auctions, too, on principle. By popular demand in our FMtuners group, an eBay seller called "qualityhifi" was elected to the Rogues' Gallery despite his 100% feedback rating. This clown listed a Kenwood KT-413 tuner, which usually sells for $10-20, for the bargain price of $650, implying that it has been transformed because he laid his hands on it: "THIS IS A REFERANCE [sic] TUNER! The KENWOOD KT-413 was a $250.00 offer in 1979. Now 28 years later it not only outperforms the level it was when it was new but it will SOUND better and bring in MORE stations than most all NEW tuners!! I have fine aligned this set to a 4uv FM Stereo Sensitivity level that only a very few tuners can compare to (and I have probably reworked those!).... The AM section also has been improved. I have other very fine tuners at far less money than this one, but due to the uniqueness of features and performance this one will be priced at this level." Of course, no one was dumb enough to buy this tuner. Welcome to TIC, slimeball. Another surprise sleazebag is Patrick Kondreck, a/k/a "spiritman68", according to our trusted contributor doug s.: "even tho spiritman68 has good feedback in over 1600 transactions, that doesn't mean you should buy anything from him. i paid ~$30 for a sherwood s3300 tuna, which he charged me $22 to ship (which is double the actual shipping cost). there was absolutely ZERO insulation between the tuna & the box bottom - i have pic where you can see the holes gouged into the cardboard, from the screws on the bottom of the foot-less tuna. this lack of insulation caused the tuning knob support to break, rendering the tuna virtually useless. the seller agreed, after much cajoling, to completely refund my money, return shipping costs included, due to such poor packaging. well, i returned the tuna, & the seller has refused to send back even one penny. so, he now has my money, insurance he collected from fedex (why they paid is beyond me), and the damaged tuna. and, of course, i have retaliatory negative feedback on ebay from him." Another nasty deed on a much smaller scale, perpetrated by a guy called "mistrwidget," is further confirmation that even a 100% feedback eBay seller can be a liar. This jerk selectively copied from TIC's writeup of the bargain-basement Realistic TM-1000 (bad enough) and also increased the dollar amounts of both the typical sales price range and the high price, all in a manner clearly intended to deceive. The tuner had one bidder and sold for $27.50, so no one was fooled. Mistrwidget mostly sells little "vintage" crap, but if he ever tries to sell a tuner again we hope he'll get the level of interest and trust he deserves. An eBay seller called "rolltide98" isn't a scammer like the guys above, but his eBay listing for a Luxman T-115 was so filled with blatant nonsense that we wouldn't trust anything he says, so we'd avoid his tuner auctions. He said that the T-115 "has won some industry sound quality awards" (we'd like to see him name just one of these supposed awards), has sold on eBay for $200-350 "depending on the exact model number and condition" (excuse us, sir, but the T-117, T-110 and other Luxman tuners that may sell in that price range are totally different tuners from the T-115, which always sells for much less), and - best of all - "it's a bargain here on eBay compared to ordering one brand new" (and how, exactly, would someone order a 1981-model tuner brand new in 2004?). Another BS artist (but not a scammer) is eBay seller "jeffreywrightbooks," who wanted to sell a Vector Research VU-1200 tuner (list price of $109.95 in 1984). This tuner has a grand total of four buttons (power on-off, AM, FM and muting), and absolutely no high-end features, but the eBay auction listing included a ton of hilarious audiophile-babble. Some examples: "This low profile unit tested well with my reference system, particularly in the pronunciation of horns and cymbals in the high end and midrange, with plenty of throat in the low mids.... I ran this unit for two straight days to capture drift information, spatial field, and to search for anomalies and particular quirks that occur in tuners (you might remember that certain early production Hafler and some Kenwood and Sansui tuners are plagued with memory, drift, and synchronization problems). [What the heck is this guy talking about? - Editor] I lifted the cover, lubricated the tuning gang bearings and bushings for quietness, and touched up the weighted dial knob to ensure smooth bandwidth travel." OK, fine, he doesn't know what "bandwidth" means, but who knows what he squirted in there to gum things up. Well Jeff, your ridiculous writeup deceived a couple of people so you managed to unload your cheapie tuner for $66.50, about $50 more than it's worth, but now you're in the Rogues' Gallery. Was it worth it? Another purveyor of misinformation on eBay is "classical88," who went into lots of detail about how the MCS 3700 was a "relabeled" Technics tuner (it's not). He then added, "Unlike most low cost digital tuners, stations can be precisely tuned in due to Technics Gyro Touch Tuning" (even if this were a Technics tuner, is it really hard to tune in stations with digital tuners?) and finally claimed that this low-cost department-store brand tuner was or is "used by many telephone system installers for background music on hold feature." Huh? A Canadian eBay seller called "roytagger" is a world-class BS artist, if his auction for an Akai PS-200T digital tuner is any indication. His statement that this unknown tuner "won many prizes as best in the world!" is so ridiculous that it can only be an outright lie. He also claims, "If you live in remote areas or downtown where radio signals are hard to pick up, this is the best choice on the market" - remarkable for a tuner that none of our panelists had ever heard of. Akai did make some sleepers and we don't have a basis for saying that this one is not a good tuner, but to say that multiple sources recognized it as "the best" is just silly. Finally, a friend of TIC says he attempted to buy a McIntosh MR 77 for $400 from a guy named Christian Schmidgall of Pompano Beach, Florida, and sent him a money order, but they couldn't agree on the shipping cost and the creep didn't send the tuner or return the money. Schmidgall used to go by "Catman777" on eBay but he changed his user name after we exposed him, so be careful dealing with ANY eBay seller from Pompano Beach. Our panelists prefer not to receive private emails requesting personalized tuner recommendations and the like. Instead, please register and use our "FMtuners" Yahoo group for all general comments and questions about tuners, mods and related topics, so that others can benefit from the discussion. You should also post in FMtuners if you have a correction or suggested addition to TIC. If you have a question on repairs, antennas or mods, you can email one of the experts named in the relevant sections above... and if you do use any of the service providers listed on TIC, we request that you post feedback in FMtuners, whether positive or negative, on your experience with that person or company.